Symphony of the Night took the best elements of the Castlevania series, injected in RPG elements, and created one of the most compelling games for the original Playstation. A platform-adventure action role-playing game, it was developed by Konami and released in 1997 for the original PlayStation. A couple weeks back, Ben asked what our favourite bad videogame was. For me, Castlevania 2: Simon’s Quest was my choice. I’ve seen (and laughed at) the AVGN video about Simon’s Quest, understand that its obscure puzzles are nearly impossible to solve without a FAQ, and have had my share of frustrations with the game. Even with its flaws, there was something about the open world and RPG elements that I really enjoyed as a kid. Symphony of the Night did Castlevania 2 right with an immersive castle and a seamlessly integrated experience system that felt perfect. Everything from the controls to the music was gaming sublimated. One of the smartest moves Konami did was letting players start Symphony of the Night as Richter Belmont. He’s the traditional whip-wielding protagonist Castlevania players were used to. He also serves as a reminder of the stiffer movements and controls of the original Belmont members. The level layout is similarly linear and felt like a Castlevania game all over again, which was I expecting. But as soon as Richter’s scene from Rondo of Blood plays out, the actual game starts proper. You’re no longer playing as a Belmont, but Alucard. 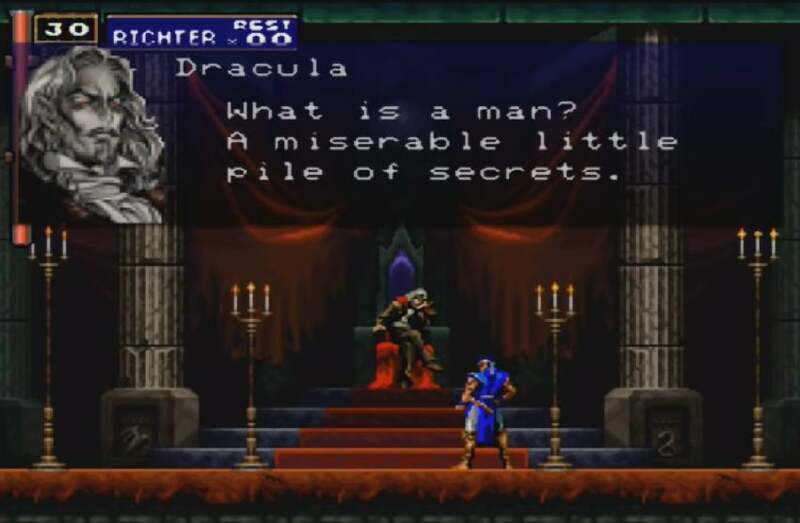 He is Dracula’s half-human half-vampire son that was first introduced in Castlevania 3 as a playable character. While he could transform into a bat, he was even slower than Trevor Belmont and was not my companion of choice (I went with Sypha Belnades). 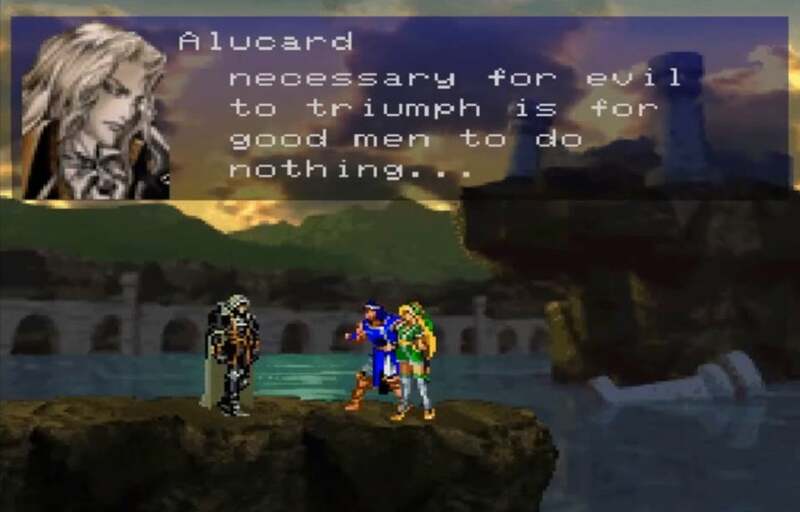 In Symphony of the Night, it’s clear Alucard has grown stronger with his 300-year sleep. He stands as a stark contrast to the Belmont family, being slick, fast, and super powerful. In his opening invasion of Dracula’s castle, his blows are deadly to point where the massive wargs burst into flames and howl in pain as Alucard strikes them. He’s so fast, he leaves behind visual trails of his past self. The feeling is incredibly fluid controlling Alucard. That is, until Death appears, asking him why he’s there. In the background, there are pikes with corpses and a swirling vortex in the sky. Death strips Alucard of all his weapons leaving him with only with his fists. Enemies that died with a single hit now take multiple punches. You are left defenceless without weapons and have to start all over. But that teasingly brief glimpse into Alucard’s power had me hooked. Your journey isn’t just about regaining your abilities, but exploring the depths of Dracula’s castle. Metaphorically, it’s Alucard forging his humanity in an environment that stands as continual reminder of his darker half. 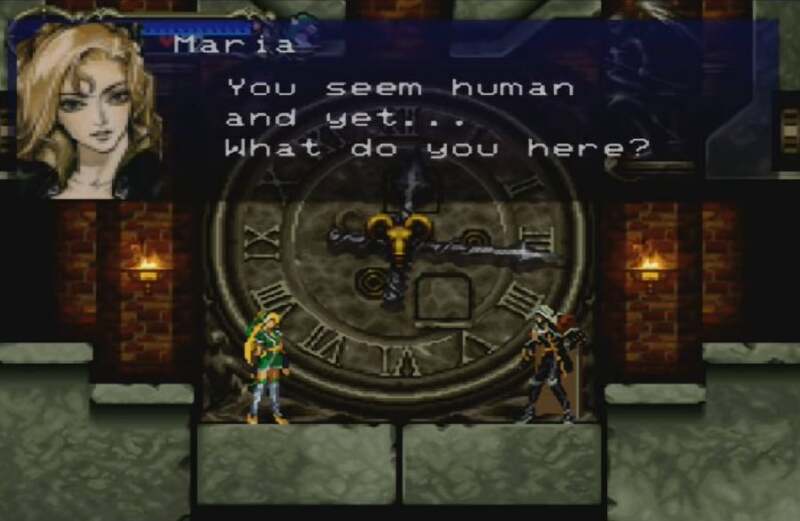 The Doppelganger boss, who mirrors Alucard, is a twisted reflection that can be frozen in time by the stopwatch. 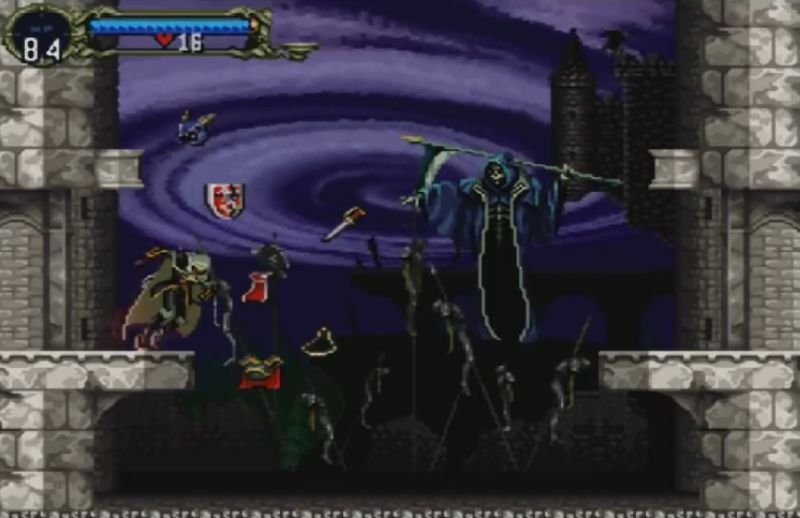 Even the later inverted castle stands as a reversion of Dracula’s name (from which Alucard gets his own name) and Alucard’s attempt to stand against his father’s evil plans. Alucard has to destroy his past, as in the symbolic fight in the Reverse Colosseum against the fake protagonists of Castlevania 3, Trevor, Grant, and Sypha. The arias and dissonant harmonies that make up the game’s music are awesome. There were areas in Symphony that I didn’t want to leave because the music was so good. The “Crystal Teardrop” in the Underground Caverns is beautiful, melancholy, and oozing with mystery. The gladiatorial strings of “Wandering Ghosts” in the Colosseum had me strumming my imaginary guitar as Alucard slashes Armor Lords into cinders. Alucard’s abilities get stronger with each attack and his agility increases as he achieves his fuller potential after every level up. He can swap out weapons and equipment, while also gaining new familiars, or monster companions, that aid him. Alucard’s double jump and his dizzying speed showcase his superhuman powers. The 2D animation is also some of the best on any platform. Even Alucard’s most unnecessary action, the back dash, was one of my favourite things to do just because it felt so good. The Metroidvania genre is all about discovery, and Symphony teems with inaccessible areas throughout its numerous hallways. These include locations like the Marble Gallery with its bloody eyeballs and the Alchemy Laboratory where science is subjected to the twisted corruption of monstrously bizarre experiments. I personally loved traversing familiar areas like the Castle Entrance (complete with Mermen) and the geared nightmare of the Clock Tower. Each of his upgrades, including the ability to shapeshift into a wolf, bat and mist, grants him further access to the castle where hidden rooms abound. Secrets are everywhere, just waiting to be exposed. One of those secrets is that Alucard suffers from a blood curse. The death of his human mother, Lisa, has haunted him his entire life. At one point, the demon, Succubus, takes advantage of his vulnerability to launch an attack in his dreams while he’s encased in one of the Save tombs. The nightmare that ensues is soaked in desaturated hues, with only Alucard and Lisa retaining their colour. 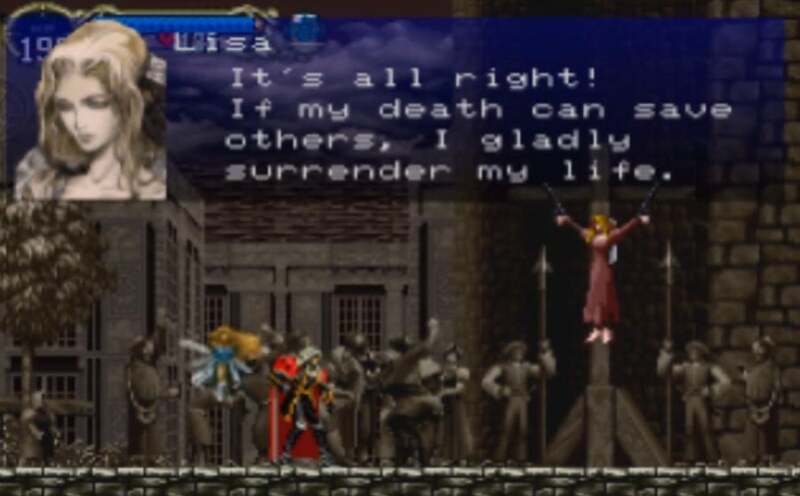 The cruel spears of human hatred are permanently frozen in his memories and Succubus distorts Lisa’s original final words, charging Alucard to “kill” the humans “and bring them happiness,” only serving to enrage him. His mother’s actual last words were to do humanity no harm as “theirs is already a hard lot.” Alucard knows this because he was there in her final moments. His attempt to honour her plea is intertwined with his stand against Dracula. The voice acting of all the major actors is melodramatic, but gives Symphony a unique charm akin to the PlayStation Resident Evil games. Dracula’s pontifications on souls and profit remains one of the most memorable all these years later. There are so many incredible memories I have of this game. Some are simple, like using the bat’s echo to navigate dark rooms and the nostalgic nod to Simon’s Quest in gathering the different parts of Vlad in the Inverted Castle like the rib, heart, and eye. The boss battles were wild, especially the fight against the massive Granfaloon with its legions of the undead on top of a hill of skulls. Alucard not only regains his original strength, but surpasses it, becoming almost overpowered. This was exciting for the time because the Belmont’s remained relatively the same from beginning to end, in contrast to the dynamic Alucard who was continually getting better. Throughout the journey, the music rages in a lament of ruin for Dracula’s minions. Symphony of the Night made sure that Metroidvania-style games became a part of gaming culture, reminding a 3D hungry industry that great 2D games still had a place. Every beat of the game exudes with polish, gorgeous graphics, and intuitive gameplay. This is the kind of symphony I could listen to for days on end and never get tired of.